One thing is constant: There will always be maps to scan and data to extract into a GIS imaging system. Rely on the accuracy and quality from a Contex wide format scanner to get the job done right — every time. Scanning accuracy of 0.1% even with the faintest details. This is made possible by Contex’s patented (All Wheel Drive) feed system. Full 1200 dpi scanning with real camera technology (CCD) and color accurate fluorescent light, called Contex Natural Light. Because a scanner without fluorescent light is virtually color blind. 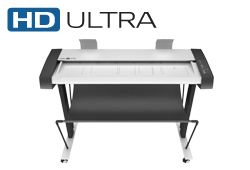 The HD Ultra is the only wide format scanner with a CRI (Color Rendering Index) above 95%.